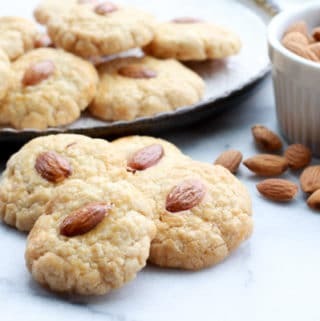 Last Updated: April 15, 2019 · Published: March 25, 2019 By: Asian Caucasian 12 Comments This post may contain affiliate links or sponsored content. I’ve been reliving my amazing trip to Singapore last year and dreaming of this classic dish. Singaporean Laksa is a local favorite and we had our fair share while there! 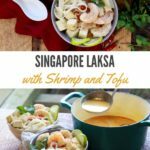 Now you can make this in your own kitchen with my Easy Singapore Laksa with Shrimp and Tofu recipe! 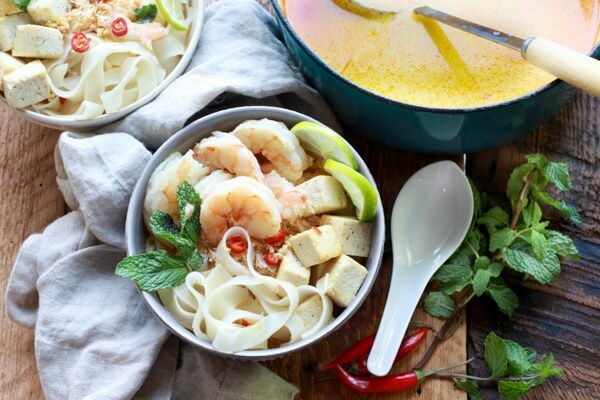 Singapore Laksa is a spicy coconut milk-based noodle soup with a coconut curry broth that is complex, fragrant, and has just the right amount of richness. Seafood stock is the base of this broth, and the flavor that comes through is every seafood lover’s dream! Store-bought laksa paste is the easy part here. It’s made with shallots, soybean oil, sugar, salt, red chilies, dried shrimp, garlic, lemongrass, turmeric, and galangal for a super rich flavor. (Galangal looks a lot like ginger, but has a sharp citrusy, almost piney flavor, while ginger is fresh, pungently spicy, and barely sweet.) But don’t worry about that because this store-bought paste makes it incredibly simple for you! All you need to do is get all the ingredients ready and start cooking! 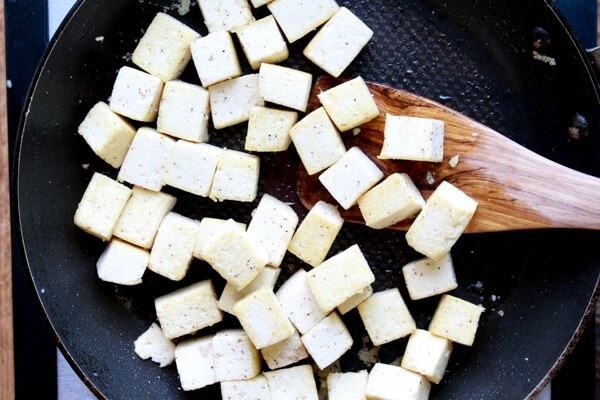 Deep-fried tofu is traditionally in this dish, but I lightened it up by pan frying the tofu. 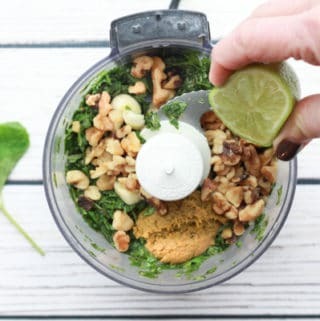 Still so delicious but healthier! Add in the Thai chili peppers and laksa paste and stir for 1 to 2 minutes. Be careful that it does not start to burn! Add in the seafood stock, coconut sugar, and kafir limes leaves and bring to a slow simmer, then add in the coconut milk, fish sauce and lemongrass. I used boxed seafood stock which is available at most grocery stores. You can make your own seafood stock, of course! Use full-fat coconut milk for the richest flavor. Bring the broth to a boil and lower to a simmer for 10 minutes. 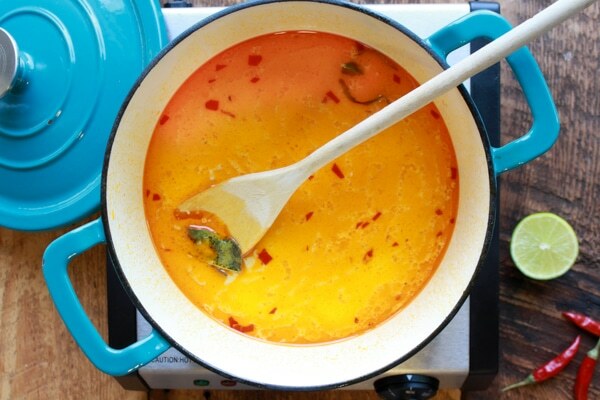 This Laksa broth cooks up very quickly but delivers such incredible flavor! 5. 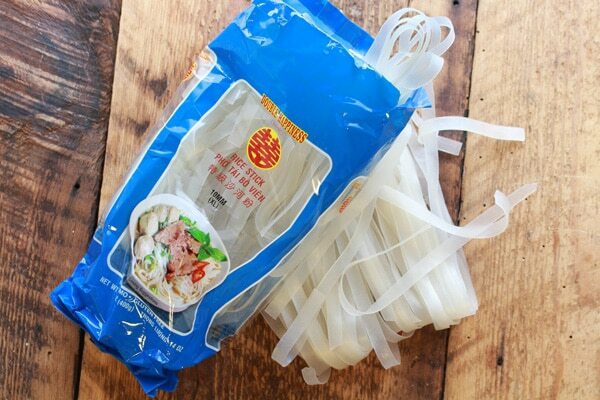 Meanwhile, cook the rice noodles according to the package directions. I like it done al dente. You can use whatever size noodles you desire. I prefer the thicker noodles for this dish. 6. 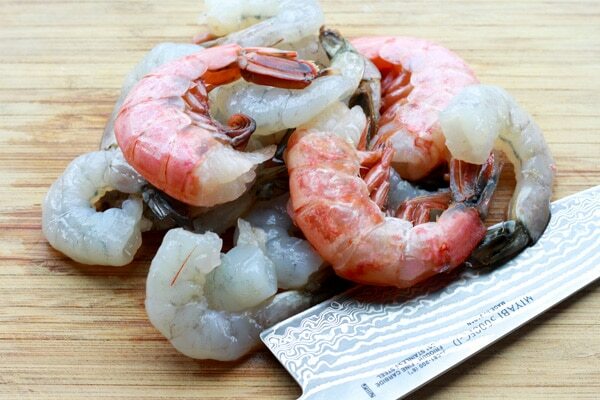 Prepare your shrimp in advance, peel and devein. I used large wild shrimp in this dish. I don’t buy farm-raised seafood any more, for obvious reasons! 7. Add in the shrimp at the very end and remove the pot from the burner, and let sit for about 10 minutes. 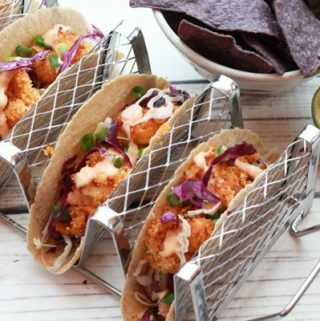 The shrimp will cook up perfectly this way! 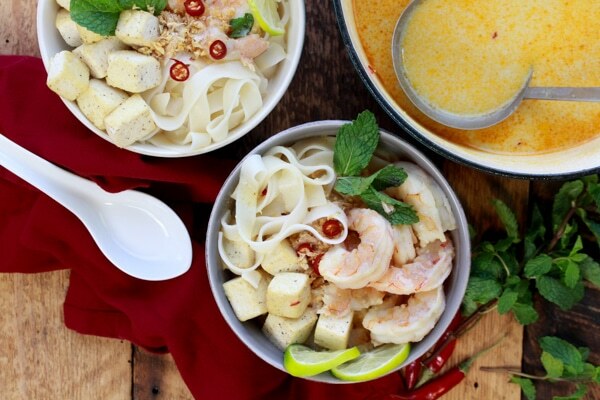 This Singapore Laksa with Shrimp and Tofu dish delivers such a flavor bomb, you’ll want to make this again and again! Place the rice noodles at the bottom of the bowls. Add the tofu cubes and shrimp on top of the noodles and ladle the laksa broth on top. Garnish with your favorite toppings: fresh mint, lime wedges, fried garlic, bean sprouts, etc. WANT MORE? 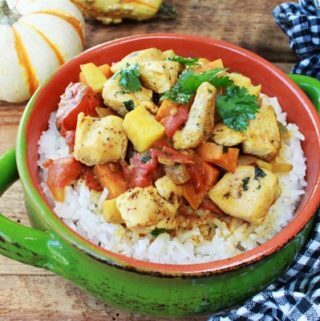 If you like this recipe, you’re going to love my Coconut Curry Shrimp and Tofu recipe! Rich and hearty, this curry tofu and shrimp bowl is absolutely delish for entertaining! 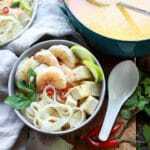 Thank you so much for sharing this amazing laksa recipe. 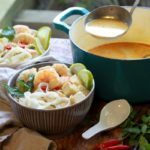 It is not a very popular meal and there are not so many laksa recipes around, so this is such a great find! Both richness and fragrance that laksa boasts of are unbeatable! 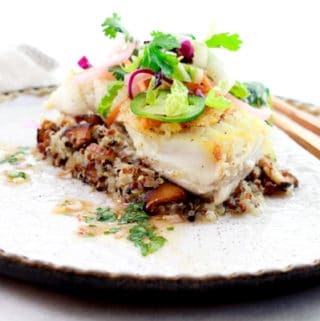 I know, it’s super popular in Singapore so it’s great to bring this recipe home! 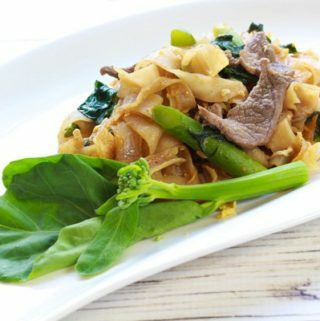 Hope you’ll try this amazing noodle dish! Have never tasted laksa, but surely would love to try. Looks like a wholesome and flavorful meal. I hope you’ll try this noodle dish because it’s so very yummy! And super easy to prepare! 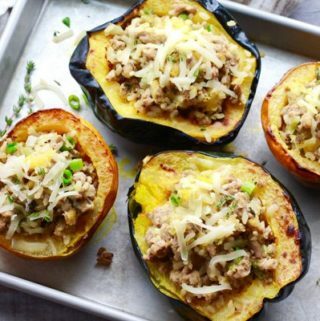 You can use just about any protein in this recipe! Hope you enjoy, Beth! I’m certainly going to look for laksa paste at our Asian market… this soup sounds delicious! Can’t wait to make it! 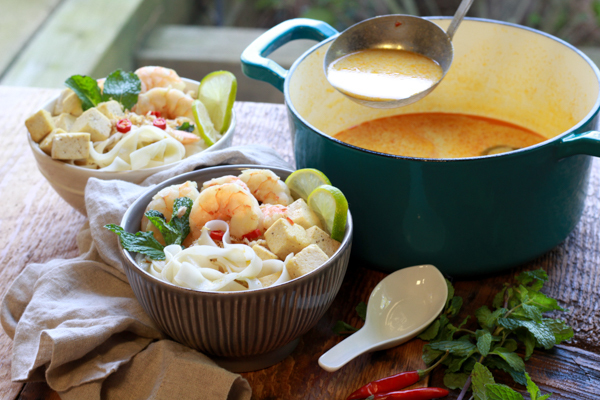 Having the laksa paste certainly makes this an easy recipe! You can find it on Amazon also! 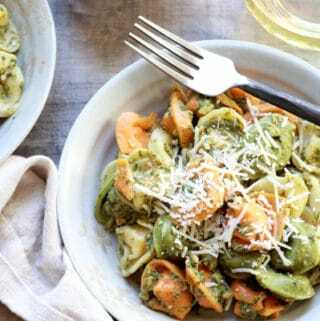 Really yummy noodle dish! I love laksa, but for some reason we haven’t had it in a while. I can’t wait to try this tasty-looking version! 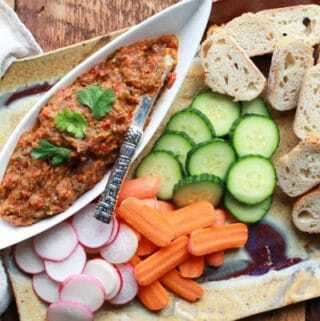 This is an easy one with the laksa paste already made for you! Hope you will try this, I highly recommend ’cause it was outstanding! I had laksa in Malaysia and it was awesome! Can’t wait to recreate this dish, thank you for the recipe! Isn’t it just so good? I have missed this dish so I recreated it for the blog and now it’s one of my faves!